I'm feeling very odd. I checked out that Fritz Kobus, in his ongoing Wagner purchases, has clicked on a Holländer recording I appreciate: the Konwitschny 1960 in Berlin for Electrola, reissued by Brilliant. It's a tad cheap. So in my endless wait for the Muti Macbeth, I checked out the prices of the Konwitschny Tannhäuser and the Knappertsbusch stereo Parsifal (1962), and they have low prices in the marketplace in Amazon UK (14€ and 17€ delivery included). I would have liked to buy one of them, but I remember that I haven't even touched the Barenboim TUI because I'm insanely busy with opera challenges and Beethoven Symphony episodes reviewing 8 cycles in each one. I need patience because probably in 5 years time I have already finished testing all the orchestral and operatic discography. I don't enjoy music, I enjoy comparing, and it's like I'm buying CDs for watching on my shelf instead of playing them. The thing now is that I'm not liking at all this Beethoven Symphony episode I'm in and I'm finding out I could like Beethoven Symphonies even less than many operas. Decision: no purchase. I hope to be wrong and like more symphonic composers out of Bruckner, Mahler and Sibelius, but I see myself in the future with a single shelf full of opera recordings and no Baroque period whatsoever. I'd love to settle down one day and listen and enjoy my favourite operas, maybe being 36 and marrying my CD collection. Alone but not lonely. I don't know, I'm not in a good mood this month. It's called lack of perspective. If you are not enjoying the Beethoven symphony cycles, shelve them for the time being. I have a half dozen or so Beethoven symphony cycles and probably four dozen or so Ninths, but rarely listen to any of it any more. I am focused into opera and even there, feel that I have spread myself too thin, bought too many operas and recordings I just don't need or listen to. But the bottom line is that I won't be bothered by it, but will listen to what my current desire leads me to. Got my ninth Wagner Ring cycle coming in the mail, and suppose I ought to give it a listen, but am not sure I ever listened to the Janowski Ring cycle I got last year. Ah well, if I get to it or it not, I will still listen to good music. But for my favorite operas, I kind of like having so many recordings, especially if none pops out as being way above the rest. With the Hollander, Sinopoli is probably my top recording, but let's see if my recent Solti and Konwitschny set pulls ahead for top place. I just switched out several from my mp3 player with several others. Nice to have so much variety within the same opera. Last edited by Fritz Kobus; Apr-08-2018 at 01:22. B001JJX7MO Handel - Israel in Egypt - Gardiner OOP!! Of course there is the individual editions of the Mackerras Janacek operas, but those ones are already sold in a cheaper box altogether. I don't think I'm missing any in this list. If you want to know, my first priority is Giulini's Rigoletto. Two days ago I made a list of all the Wagner Walhall recordings I wanted to buy (because I had already tried them). The other list with ASINs I needed to do was the one for DG & Decca Originals, which have a nice price and offer a phisical libretto. I think this collection is very likely to go OOP sooner than later and that's why I'd like to do challenges of each opera on this list, in the case I want to buy exactly that Originals recording. Plug those ASINs into www.bookbutler.com and it will give you the cheapest prices and the UPC which can then be run through Ebay. Because I used the hell out of Discogs and Bookbutler for this list. You. Just making sure you were aware. Guess the other place to look for some of this is OperaDepot and they are having a sale right now. 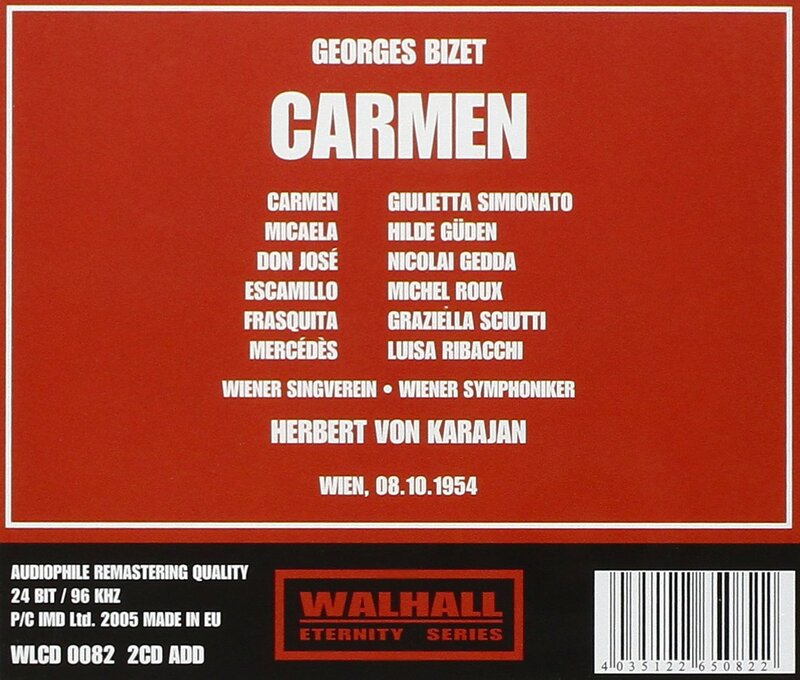 I'm checking right now if I should buy more than just one Vienna Carmen by Karajan. There is of course the famous Vienna Karajan with Price and Corelli. Last edited by DavidA; May-26-2018 at 06:05. Been listening to the Vienna performance again - it is a really gripping performance, especially from Karajan and Simionato. Really dramatic. I'd be interested to hear the La Scala performance with di Stefano. Sadly, although Culshaw wanted him on the Schippers recording, del Monaco persuaded the powers that be he should record the role, this pretty well ruining what would have been a very good performance . Last edited by DavidA; May-26-2018 at 11:56. Yeah, that would be an interesting piece of history. 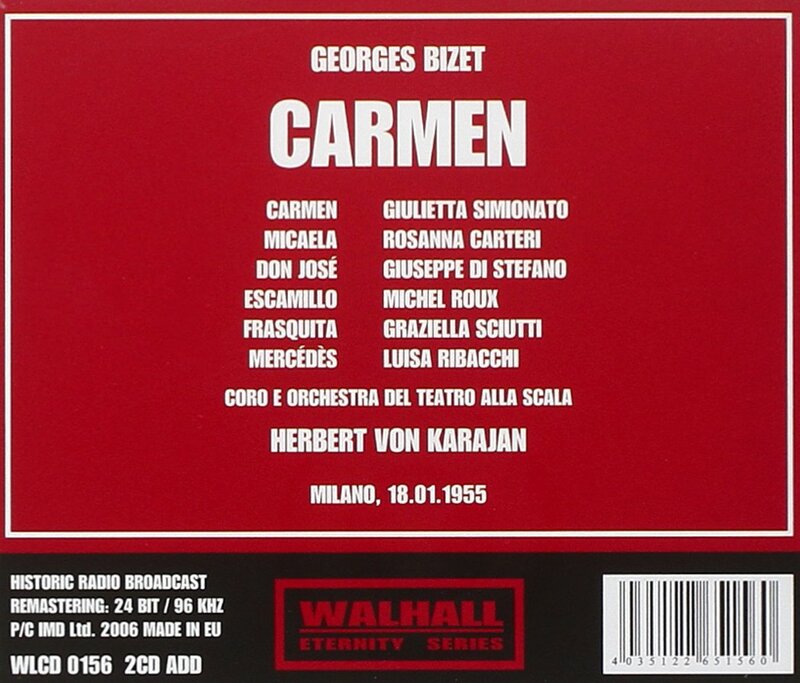 Why did both the Studio Vienna Carmen by Karajan and the Swiss Carmen by Schippers fall into oblivion? I guess there was a sharing agreement between Decca and RCA in terms of release rights. The later Karajan recording with the VPO (Price and Corelli) is still widely available and has been reissued by Decca. 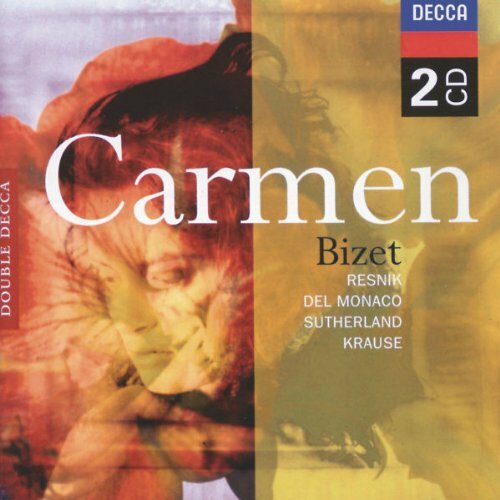 The Schippers is worth a listen for some vital conducting, Resik's Carmen but every time Del Monaco comes on he just bawls his head off in appalling French. Still available. The VSO with Simionato was a radio broadcast recording and has a limited circulation..
Last edited by DavidA; May-26-2018 at 12:51. I've only found on print B0041KUO5Q and B00000425U for Schippers' Carmen, but none for Karajan's first studio recoding in Vienna. I note Amazon saying Karajan / Price unavailable. I recently saw it in a second hand shop for under £5 which was annoying as I already had it. I love a bargain! Just listening to the Karajan 1954 Vienna. it is quite different from his later Vienna with Price. So much for tin-eared critics who say he conducted everything the same! Gedda is a revelation - quite superb in the first two acts although his lyric tenor lacks some heft for the last half. I wouldn't put it above the Karajan / Price but it is certainly a very vital performance. Last edited by DavidA; Jun-03-2018 at 20:57.